A mid-cycle update to the already great OnePlus 3 brings a better processor, bigger battery, and higher-res front camera to stay ahead of competitors. OnePlus has never been one to play by the rules. Back when it made its entrance into the crowded smartphone market with the One, it set itself apart by selling a premium handset at a mid-tier price and offering invitation-only purchases instead of the standard preorders. The 3T very much fits with this rebellious nature. Essentially a refreshed version of the 6-month-old OnePlus 3, the new phone undermines another smartphone constant: the yearly update. iPhone users are familiar with the concept of the mid-cycle model—a handset that keeps the same enclosure but beefs up features and internal components. But there’s always been a special hook with Apple’s S phones, a reason for current owners to rush out and buy the new model. The 3T could be seen as OnePlus’ attempt to mimic the success Apple has had with the formula (and in fact, the company says it picked T for the new phone’s surname simply because it’s a letter higher than S). Nonetheless, the upgrades in the 3T shouldn’t be enough to create any jealousy among current OnePlus 3 owners. Rather, they seem designed to keep OnePlus on top of the mid-range market, and if anyone was on the fence about purchasing the 3, the 3T would likely push them over. The OnePlus 3T is more than just a cool new color, but the Gunmetal hue is gorgeous. On the outside, the OnePlus 3T is identical to the model it replaces. That’s not a bad thing, and the cool metallic tones of the new Gunmetal gray color do well to accentuate the phone’s clean lines and understated elegance. Like its predecessor, the 3T is one of the more comfortable phones I’ve held, with a diminutive frame that belies its 5.5-inch screen. There still isn’t an SD card slot, but thankfully the handy mute button remains, as does the fingerprint sensor, which is as fast and accurate as any I’ve used. With a tight screen-to-body ratio, most of the front of the phone is taken up by the display, and it’s a great one. Spec-wise, it’s identical to its predecessor—a 5.5-inch 1080p AMOLED—but there’s no reason to complain about that. It can be excessively bright and bold at times, but a night mode and dark theme do well to mute the intensity when using it in bed. And the sRGB calibration setting that was missing from early versions of OxygenOS on the 3 also works to tone down the display a bit (though it does impart a slight green hue). But anyone can make a gorgeous handset these days, and besides, the 3T isn’t trying to improving on the 3’s looks. It’s about specs, and in that vein, the 3T has been fitted with the most recent Snapdragon processor (the 821) and a larger 3400mAh battery. These are decent but not to-die-for spec improvements over the previous phone (which admittedly was already pretty great in the components department). The OnePlus 3T’s Snapdragon 821 processor puts it on even footing with the Pixel. The difference between the two processors isn’t all that measurable. The 821 chip promises better battery efficiency, but offers a theoretical speed boost of only about 10 percent over the 820—not something you’re going to notice in daily use. Nonetheless, the 3T is a screamer, running and switching between apps and games with ease, and deftly handling everything I threw at it. During my testing the phone exhibited no signs of lag or stuttering, and certainly not any of the touch latency issues other users have experienced. Along with a more efficient processor, the 3T’s larger cell provides battery-life benefits, and I was able to consistently get through a day’s work (and play) without reaching for a power cord. And when I did, it wasn’t plugged in for long. OnePlus supplies the same Dash charging setup it did with the 3, and charging lives up to the company’s claims. Charging is super fast—noticeably quicker than the Nexus 6P and about twice as fast as the glacial iPhone 7 Plus—but the wall unit is unfortunately just as bulky as the 3’s. And until OnePlus licenses the tech, it remains the only way to get a quick charge on the 3T. The OnePlus 3T’s bigger battery means you won’t have to worry about getting through a day’s work. All said, the newer parts command a $40 premium over the OnePlus 3, and if you want the new 128GB model, that’ll cost you another $40. Add it up and you’ve got a handset that costs 10 to 20 percent more than the $399 OnePlus 3—still a great deal but not quite the unbelievable bargain of the previous model. And you still can’t use a OnePlus 3 variant on Verizon or Sprint, which is a bummer. 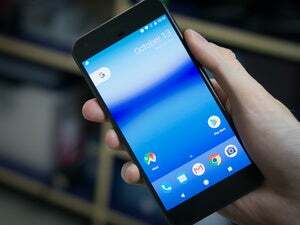 But at $479, the 3T is still several hundred dollars cheaper than the Pixel XL, which uses the same processor. The mid-cycle chip and battery upgrades all but ensure another similarly priced phone won’t be able to topple the 3T before the OnePlus’ next major revision (at least when it comes to benchmarks), a strategy that hasn’t been used by other handset makers. These aren’t huge improvements—certainly not the kind that iPhone users expect from Apple—but it makes the OnePlus 3 a new phone again, replete with all the attention that brings. In the right light, the OnePlus 3T’s front camera takes pretty great selfies. Aside from the chip and the battery, the only other component of the 3T that’s been upgraded is the camera. But surprisingly, OnePlus didn’t set out to boost the rear camera, opting instead to focus on the selfie shooter in the front, a move that will certainly appeal to obsessive Snapchatters (at least those who haven’t bought a pair of Spectacles yet). OnePlus has doubled the megapixels to 16, pretty much unheard of in a smartphone at this or any price (the iPhone 7’s front camera is 7MP, while the Pixel’s is 8MP). The result is a front camera that’s just as sharp as the rear one on some of its peers. When you’re using the main camera, the OnePlus 3T is capable of taking some pretty great nighttime shots. That’s not to say you’re going to be going out of your way to use your 3T to take selfies instead of portraits. Even with the higher resolution, it still suffers from the typical selfie-cam problem of poor low-light performance. In certain nighttime settings, the camera often struggled to identify multiple faces in a frame (rendering the auto selfie Smile Capture feature useless), and the resulting images were grainy and out of focus. So while it might not have any new parts to speak of, the main rear camera is still the star of the show, with image stabilization, excellent manual controls and touch focus—all of which are unavailable in the front-facing camera. If OnePlus were to bring any of those features to the selfie cam, it would have a killer package. When it’s dark, the OnePlus 3T’s beefed-up front camera still takes grainy, out-of-focus shots. But a 16MP front camera is still a massive leap forward, and with Google’s Duo app set to make video calls a bit more commonplace among Android users, the 3T’s 16MP secondary shooter could become the de facto standard for the next round of handsets, at least in terms of pure specs. OxygenOS on the 3T still runs Android 6.0.1, but Marshmallow has never looked better. Since OnePlus has targeted the newest competing handsets, it’s surprising that the 3T doesn’t ship with a Nougat-flavored version of Oxygen OS, especially since a beta is already making the rounds. But even though the latest build (3.5.3) is still based on Android 6.0.1, Marshmallow doesn’t look the least bit stale on the 3T. The OnePlus 3T includes a really nice-looking minimal weather app, but it needs some curious permissions to run. OnePlus takes a light brush to Android’s stock interface, adding just enough tweaks to remind users the OS has been customized, while respecting Google’s vision overall. OnePlus changes some icons and adds a couple of apps, most notably a Weather app that takes a pretty good crack at what a bonafide Material Design weather forecaster would look like. Simple and elegant, it’s better than most of weather apps in the Play Store, but I can’t for the life of me imagine why it refuses to run without permission to make and mange phone calls. OnePlus’ trademark focus on customization is also on full display, and you get tremendous granular control over the interface, particularly with the capacitive buttons, which can be programmed to launch the camera, summon Google Now, and other tasks. Furthermore, OnePlus’ proprietary Shelf still occupies the customary location on the screen to the left of your home screen, offering bite-sized chunks of data without cluttering the home screen with widgets. If you were considering buying a OnePlus 3, the 3T gives you more bang at a slightly higher buck. None of phone’s upgrades make the 3T all that much better than the model it replaces, and OnePlus could probably have left well enough alone and simply updated to the 4 next spring as expected. But OnePlus isn’t about managing expectations, and in many ways the 3T exists solely to defy them. With relatively modest upgrades to the processor, battery and front-facing camera, OnePlus didn’t deliver the massive boosts one expects in annual updates, and I’d be surprised if any OnePlus 3 owners felt the need to buy the new phone. So, instead, what we have here is a case of OnePlus simply bumping up the specs of its flagship handset as soon as new components became available—and why not? Even with a price hike of $439 for the base 64GB model and $479 for the 128GB one, anyone buying the 3T during the holiday shopping season won’t have to worry about an old chip or small battery, and most buyers won’t mind the extra costs for better specs. It remains to be seen whether this is the start of a new release schedule for OnePlus or a one-time-only experiment. But the 3T improves on what was already one of the best phones of the year, and it’s hard to find a fault with mid-cycle, incremental improvements. For years, OnePlus has been imploring us to Never Settle, and with the 3T, you don’t have to. With a better processor, battery, and front camera, the OnePlus 3T is a tune-up of an already great phone.